What do you get when you combine a talented young playwright, an excellent cast that includes five up-and-coming actors and two beloved veterans of local stages, stirring a capella gospel music arranged by a local musical legend, and the Twin Cities' best director of "theater musically?" 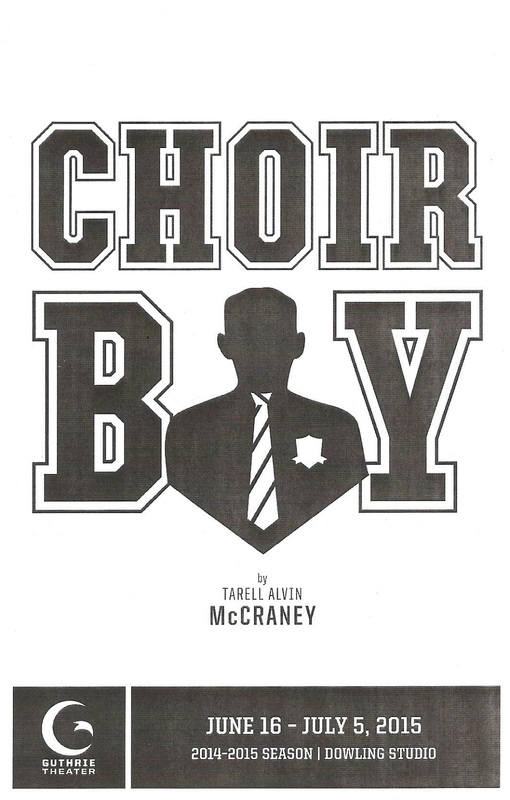 You get Choir Boy, a lovely and affecting play about a young gay man coming of age in an African American boarding school. The playwright is Tarell Alvin McCraney of the excellent Brother/Sister trilogy that Pillsbury House Theatre has produced in its entirety in the last several years. While those plays have an epic, mythical quality, Choir Boy is more grounded in reality, but just as beautifully written. Add in musical direction and arrangement by Sanford Moore and direction by Peter Rothstein, an expert at using music in the best possibly way to enhance the theatrical storytelling, and you have something quite special going on in the Guthrie's Dowling Studio. 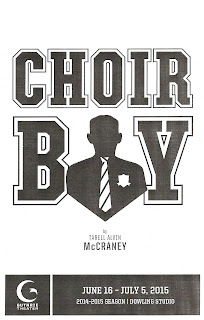 Choir Boy centers around five young men at Drew Prep School, a fictional African American boarding school (of which, the playbill tells us, only four exist). We witness their lives over the course of a school year, beginning with graduation at which Pharus (John-Michael Lyles) proudly leads the choir in the school song, until distracted by some homophobic heckling by his classmate Bobby (Darrick Mosley), who happens to be the nephew of the Headmaster (James Craven). This causes some tension in the choir room when the boys return to school in the fall, and newly appointed choir leader Pharus kicks Bobby off the choir, while allowing his sidekick Junior (Kory LaQuess Pullam) to stay. Pharus has a sweet friendship with his roommate AJ (Ryan Colbert), and some unspoken history with David (Nathan Barlow). A new (white) teacher (Robert Dorfman) comes in and tries to shake things up, challenging the boys to think about things in a new way. As graduation rolls around again, these five young men are in a different place in their lives, a bit older, a bit wiser, a bit more lost or a bit more found. It's really a slice of life kind of play, where you can imagine these characters' lives existing before the actions of the play, and continuing after the actions of the play, in a direction that's not clearly spelled out. We don't know the full stories of their lives, but getting to watch a year of their lives over the course of 90 minutes is a fulfilling and rewarding experience. This play truly depicts the universal struggle of being a teenager and trying to figure out who you are and what your place is in this world, when so many external sources are telling you what to do, be, and think. This is conveyed through the specific challenges of being a young gay man in a strict Christian African American boarding school. And the music, which is absolutely beautiful and essential to the piece, really helps to create the specific world. Under the direction/arrangement of Sanford Moore, these five young men create some beautiful harmonies and fascinatin' rhythms on these traditional gospel and spiritual songs with a modern twist. The music is placed perfectly to enhance the storytelling, whether the song is mournful or joyful, and happens organically in scene transitions, rehearsals, or performances. John-Michael Lyles is the one member of this excellent seven-man cast who's new to the Twin Cities theater scene, and he's just perfect for his role. He creates a real and well-defined character in Pharus, alternately frustrating and sympathetic (if the Drew choir is Glee, Pharus is Rachel Berry, full of talent and not afraid to say it). The four other young men are bright young local talent seen on various stages around the Cities in the last few years, and it's nice to see them all shine as individuals and as a group in this piece. James Craven always makes everything better, here as the stern Headmaster who truly cares for these boys at the same time he's frustrated, perplexed, and annoyed by them. Last but not least is Robert Dorfman, his portrayal of the eccentric teacher in nice contrast to the otherwise strict boarding school environment and providing some comic relief - bumbling, putting his foot in his mouth, but passionate about his job and reaching young minds. Michael Hoover's sharp set simultaneously represents five different settings (dorm room, Headmaster's office, showers, classroom, and yard) on multiple levels, making great use of the upper story balcony in the Dowling Studio. And what was it that Chekhov said? If you show a shower on stage, you must have a shower scene? Both Damn Yankees and Choir Boy deliver on that promise, although the latter with more realism. I saw Choir Boy last Saturday night at the Guthrie Theater, home of three stages in one building. It also happened to be the first preview of The Music Man, and the joint was jumping! Even though I was annoyed to find my usual parking level full, and people clogging the escalator, hallways, and bathrooms, like the man I rode the elevator with said, it's nice to see so many people out supporting the arts. And three such different plays on the three stages - a 90-year-old Irish play that is departing Artistic Director Joe Dowling's swan song, one of the most beloved American musicals, and this exciting new play about young African American men coming of age. Some 2000 people, all gathered together in one space to share in the experience of live theater - what a beautiful thing (thanks again Joe Dowling!). Choir Boy continues through July 5.